Hello everyone, as promised, we are back with another Giveaway. This time there will not be just 1 but 3 winners who will win different goodies shown in the pics below. Before mentioning the rules and steps to follow to participate in the giveaway we would like to clear few things. As most of you might be aware that we had cancelled our last giveaway as the winner unfollowed us after winning the contest. However, we have clearly mentioned that we had voided the contest still we received messages on our facebook and Instagram to unblock her. To be honest I didn’t want to cancel the giveaway because she had really put efforts and that was why we chose her the winner. But we have to stick to the guidelines. Anyway, I have no idea whether she intentionally unfollowed us or it was some kind of glitch in Instagram, but on further checking her account we found out that it is an account only for giveaways, and not a genuine personal account. Sorry for this long read but we have to make few things clear before announcement. It’s not like we owe any explanation to anyone but we want to make the point very clear so that this thing won’t happen in the future. Alright, now lets talk about the rules to follow. You should be follower of IBH on Instagram, Twitter, Google+, Facebook, and Youtube. Comment down below which prize do you want to win and why? 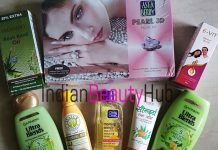 The Giveaway is open for indian residents only. The contest will run for two days 13th to 14th and 3 winners will be announced randomly on 15th of October. 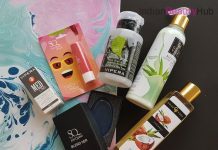 I am really excited about prize 3 as it has vit e oil n innisfree mask……..have been following u quite a while n motivated by the way u take care of ua skin even after delivery…..excited for the giveaway…. 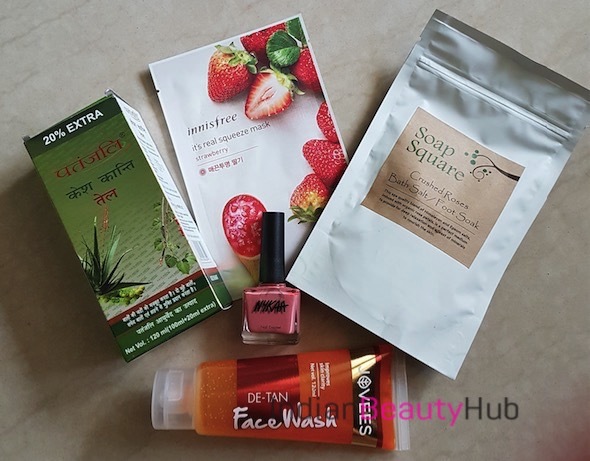 I would like to win the first giveaway as it contains soap square bath salt which is a must if you want to relax your tense muscles, rose init calm your senses, the innisfree mask sheet for the glow that you need in this festive season, jovees I have heard alot about this brand but never able to use one so. 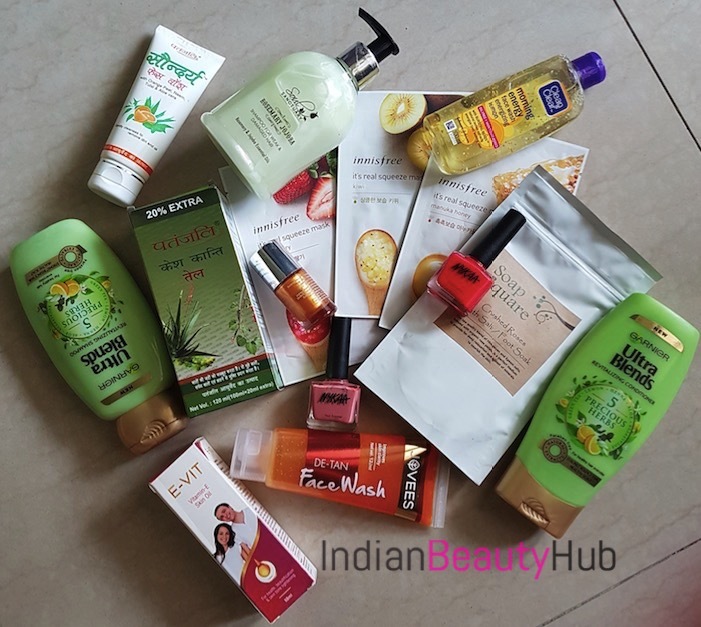 Would love to try this one out, and who can say no to Patanjali’s completely herbal products. Thanks for the giveaway. Wish you happy Diwali in advance. I really wish to win the 2nd prize. Being a college student I don’t get enough time to oil my hair. 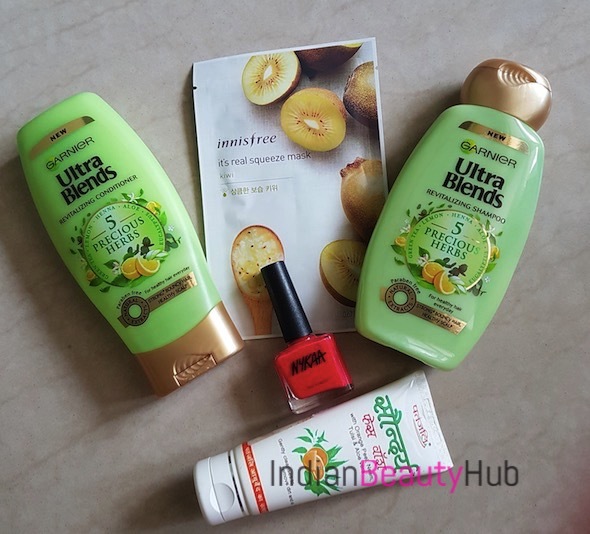 Garnier ultra blends is the best thing to take care of my hair. Following you in all platforms. Thanks for organizing this giveaway. It must have been a pain canceling & then re-organizing. Wish you never encounter such frauds again.